A teenage mum has been brutally stabbed in her eyes, throat and forehead right in front of her daughter by her on-off boyfriend. 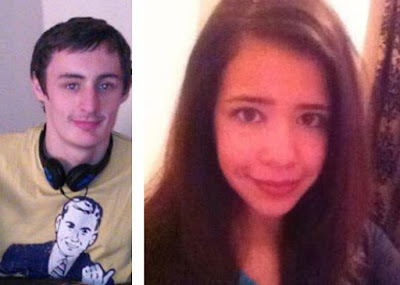 A court has heard that Katrina Evemy was brutally slaughtered after he found out she kissed someone else. She was stabbed in the neck, eyes, forehead and torso in the horrifying attack in South Wales. According to The Sun UK, her former boyfriend Dylan Harries is accused of murdering her but claims he found her on the floor on April 13 after she had been attacked. The court heard he took an 8cm blade from his house and confronted the 19-year-old after finding out she had kissed another man. The prosecution alleges the 22-year-old man stabbed Katrina as her young daughter watched and became spattered in her mother's blood. She went into cardiac arrest but was resuscitated by medics before being rushed to hospital. She had separate, traumatic bleeding on the brain and a skull fracture which could have been cause by a blow to the head or by her hitting her head on something. Dr John Gorst, a consultant in intensive care, told the jury Katrina was taken into emergency surgery to repair the "life-threatening" liver and neck injuries, which were still bleeding, he said. He said Katrina's condition deteriorated and on April 19 brainstem tests confirmed that she had died. Pathologist Dr Stephen Leadbeatter, who carried out the post-mortem examination, said he noted injuries to Katrina 's head, eyes, face, neck, chest, abdomen, thigh, arm, hands and back. "The wound in each eyelid was in my view a stab wound to each eye and there had been some damage to the optic nerve on the left," he said. Dr Leadbeatter said he found four "punctuate" injuries on Katrina's forehead which had the "appearance of a stab from a point". The court previously heard Harries went to Katrina's house at around 5pm carrying a knife. Patrick Harrington QC, for the prosecution, said Harries could be seen on the CCTV "adjusting the knife" in his hand as he walked to her house. Mr Harrington added that Harries stayed in the house for 40 to 45 minutes, before raising the alarm with neighbours and claiming Katrina was attacked before he arrived. Mr Harrington said: "He still maintains a pretence that he was not responsible for her injuries but that he had happened upon her lying dying on the kitchen floor having been attacked by some unknown person. "This is all a lie, he was the person responsible for the attack upon Katrina." Harries denies the charge. The trial, expected to last two weeks, continues.